I couldn't have put it better myself Effie , it seems the British population are being sacrificed on the alter of Franco/German business . Bravo, Effie spot on comment, totally agree. Effie Deans PM in the making. You have profoundly misunderstood nearly everything you attempt to comment on, both in terms of 20th century history and contemporary politics. Wasn’t worth the time writing the post. I disagree: this post encapsulates many of the fallacies and misunderstandings informing the worldview of those who are currently urging the United Kingdom towards disintegration. It occurs to me that my reply was not ac clear as it might have been. It is your second sentence with which I agree, while your first is, of course, spot-on. Nevertheless, I believe it useful for such as Effie to encapsulate the worldview of the North Britons on a public platform. As their despair mounts, they will consider ever-more desperate measures. It is imperative for all alert citizens to be aware of what these unhappy people may be contemplating. The European state system, over the past generations, has generated four general conflicts. All of them spilled out across the world. The most recent two drew in outside powers whose intervention was crucial. The settlement that ended the second one, while it reintroduced many of the evils of the old order (I do *not* share Professor Kissinger's enthusiasm for Prince Metternich), avoided a general conflict for nearly a century. The settlement that ended the third general conflict was rightly seen at the time as a postponement at best of further general conflict. By the way, the article of the Irish Constitution claiming the North was repealed by referendum. I will not repeat this fact again, neither will I repeat any other of the corrections already made to the numerous inaccuracies posted on this blog. [1/2] Prob a waste of time posting this as Effie engages rarely with commenters—but I noticed she did once recently so I’ll make one more effort, even though on some matters I’m only repeating sourced points I’ve made here before. In broad agreement but for a couple of points. The Poles used us as much as we used them, to fight their nation’s conqueror. This is explicitly stated on the monument to the Polish 1st Armoured Division in Warsaw, which displays the words of their commander, General Stanisław Maczek: ‘The Polish soldier fights for the freedom of all nations but dies only for Poland.’ Only for Poland. Let’s not be too sentimental about the Poles, who are not and never have been our BFFs (surely that honour goes to Portugal? ), having fought against us in the past (and Buonaparte’s Polish lancers were notorious for killing our wounded and troops attempting to surrender in the Peninsular War); and there were far too many Poles promoting the breakup of our kingdom in 2014. 2. Yes, David Davis or JRM. 7. Yes, and it’s about time the Irish enjoyed the full fruits of the independence they killed so many for, and were treated like the foreigners they fought to be. But Crimea is Russian clay, as is the rest of Ukraine. Украина — это Россия. With Russia no longer Communist (not that their Communism prevented us being allies in WW2), we have no cause to be antagonistic towards them. They would be allies against extreme Islam, and indifferently to benignly neutral in other spheres. Comparing Russia’s promotion of Christianity and family and their stance against depravity with the West’s opposite positions, one can only think of the Mitchell & Webb line: ‘Are we the baddies?’ Btw, English, Scottish and British connections to Russia have a long history and are very interesting to research: maybe start with Fifer Samuel Grieg (1735–88), described by some as the ‘father of the Russian Navy’. Vietnam was one of USG’s first goes at regime change on their ***ally*** when they sponsored a coup and had Ngô Đình Diệm and his brother Ngô Đình Nhu murdered; then after turning that country and Cambodia into ruins, they cut and run and left their ***allies*** to the Communists. They shafted us and France at Suez (to the point of contemplating military action against us), as they preferred to chummy up to Soviet-backed Muslims rather than be loyal to their ***allies*** who only 3 years prior had been shoulder to shoulder with them in Korea. 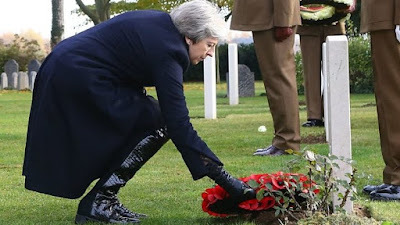 They did nothing to prevent arms going to the IRA and their courts gave sanctuary to IRA terrorists, Irish-American votes being more important to their politicians than the lives of British soldiers, women and children—their Nato ***ally***. They shafted us over the Cod War with Iceland, Johnny-Come-Lately Iceland being more important to USG than the ***ally*** of three wars. Granted it is partly our various governments’ fault for not recognising how ruthless and unsentimental USG is in pursuit of what it perceives as its interests. In terms of the Prisoner’s Dilemma, we are constantly playing the Nice strategy to our opponent’s Nasty. Similar to how it’s been said of Chamberlain that he was a gentleman and treated others like gentlemen, not realising that he was dealing with thugs. But people need to lose the rose-tinted spectacles when viewing the US. See the poignant letter of Cambodian prime minister Sirik Matak to US ambassador; Sirik was later executed by the Khmer Rouge. ‘I thank you very sincerely for your letter and for your offer to transport me towards freedom. I cannot, alas, leave in such a cowardly fashion. As for you, and in particular for your great country, I never believed for a moment that you would have this sentiment of abandoning a people which has chosen liberty. You have refused us your protection, and we can do nothing about it. ‘Please accept, Excellency and dear friend, my faithful and friendly sentiments. P.S. What we need is the DUP going national, and a merger with UKIP would have a solid chance of breaking into the mainstream. It would transform UKIP into a party with 10 Westminster MPs (two behind LibDems) in loose coalition with the Tories; while giving the DUP a foundation of national support to build on. That the DUP are the most successful party in NI (and associated with Tory govt.) should help to tempt high quality candidates (Col. Tim Collins?) to stand nationally. And with the ethnic and cultural connections between Ulster and Scotland along with the ‘Ulsterisation of Scottish Politics’, a national DUP could expect to do well in Scotland at least, strengthening their appearing a serious contender for No.10. Delighted to read your comments. Lots of good points. I just can't answer them all directly. Would mean writing two blogs instead of one and I barely have time to write one. Professor Christopher Castle's thesis, that the outbreak of the third general conflict was consequent upon a breakdown in the European state system, is sustained by overwhelming evidence and flawless logic. For once, the statutory summer crisis in the Balkans was not wrapped up under the aegis of the Powers, and the consequences are still so painfully with us. One of my grandfathers was taken prisoner and spent many, many months working in the forests of East Prussia. (I cannot hear a choir singing 'Land der dunkel Waelder' without needing to pause, swallow, and blink hard.) The other served on the Western Front, and was then sent to help occupy Cologne. He and his comrades were told that any disrespectful conduct towards the civilian population would be met with the full force of the King's Regulations. (It is worth reflecting how different some things could have been had the Crown Forces in Ireland been similarly instructed.) As frosty as the citizens' response was at first, the atmosphere eventually thawed and the father of the family where Grandad and a friend were billeted even said that there could be a place for him in the family business to replace the son lost in the War. When the BAOR left, the two Tommies apologized for intruding themselves, and assured the family that they would never have dreamed of so doing had it been up to him. The family told them not to give it another thought and, indeed, expressed their pleasant surprise at how clean their uninvited lodgers had been. Mr. Tony Abbot's view would seem to be at variance with that of the Australian Government. They are currently engaged in negotiating a comprehensive trade agreement with the European, which is clearly the background to President Macron's recent visit to Australia. Amongst the matters he discussed were the purchase by the Royal Australian Navy of submarines built in French shipyards. Exactly, Effie. My Granddad got shot up by the Germans on Anzio beach and was crippled for life. And for what? 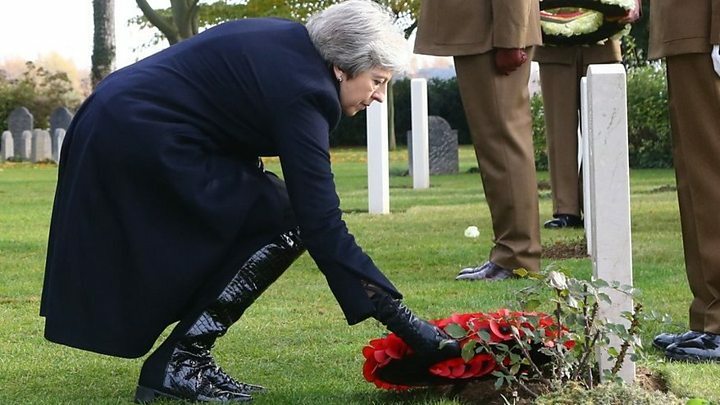 So that a few short decades later a miserably inept Prime Minister who is not fit to lace his boots or the boots of his comrades can sign away the freedoms they were fighting for? If they’d had a crystal ball I doubt they'd have bothered. Re. Point 7 - I would go one step further and undertake to use a portion of the £39bn to build a border wall in retaliation to Varadkar's and the Irish establishment's hostility to us. Absolutely with you in point 10. I would be using this as an opportunity to shrink the state while cutting income tax, VAT, corporation tax, and business rates, the aim being to get the latter two to zero. Were I French, I would in no circumstances vote for Emmanuel Macron. Nevertheless, the speech he just made to the Bundestag has moved me to the depths. I should qualify this: I would certainly vote for him were they choice between him and some candidate such as Marine le Pen. Soldier from British Army now playing the Last Post before the Bundestag. My family, on both sides, came through the next general conflict less damaged than some that I know. An uncle has no known grave but the sea, while my father survived a burning ship. My mother, in the first summer of that war. stepped over exhausted soldiers sleeping on the pavement while on her way to school, and went on to take turns at firewatching during air raids. Mt grandparents were dug out of the rubble of their home by some Polish sailors. At the last Christmas of the War, the family had a prisoner of war to dinner (when I say 'dinner', you know what I mean). He and the soldier escorting him brought as gifts tiny items of rations that were deeply appreciated. Carols were sung, and all spoke of loss and of hope. Everyone present, including the three men with all those years of military service between them, agreed that, once the current horror was over, everybody without exception must do everything in their power to make sure that nothing like this ever happened again. David Davis was in Washington at the weekend to conduct USA trade deals. But wait, May’s deal means being in the customs union which doesn’t allow independent trade deals..? What’s going on? The only answer can be a secret plan to get through Brexit then leave the customs union. But how is that possible with the back stop? Oh yeah... they engineer reunification of N. Ireland and Ireland, then they can leave the customs union and get their USA trade deal. So aye, David Davis or Gove for PM? Careful what you wish for, Effie, they’ll sell out Northern Ireland in a heartbeat if it wins them the big American trade deal prize. That’s what Brexit ‘s all about, remember. A famous cartoon portrayed an exhausted soldier holding out the olive branch. "Here it is," he says, " - don't lose it this time." Millions of families took this spirit into their hearts. A way had to be found of reforming the European state system in such a way as to preclude future conflict. For the time being, the Cold War froze all those other sources of conflict, but the wisest amongst us knew that we could not rely indefinitely for peace on the prospect of total destruction. The fruit of their labours has been the constellation of agreements and institutions which includes the European Charter of Human Rights, the Council of Europe, and the European Union. I would question your adverb 'again', Running. The most bellicose, in my experience, are not those who served in any armed conflict. The people keenest on warlike verbosity seem to have been children in the Forties and Fifties, and been nurtured on a diet of war comics and B&W films.